I WHIP MY(beautiful, colorful and feisty) HAIR BACK AND FORTH. This is amazing Well Done! this pic is absolutely amazing!! Sorry I Didn't tell you this earlier, I should've. But, I made a picture and put yours on there. If you don't want me to have the picture anymore I'll delete it, cause it's mainly yours. But other than that... here it is hope you like it. I've just listened two songs, but i like them. this is soooo intense i love it ! This image has been featured in a TWLOHA Dedication News Article as well as my Journal! If you like the article, please the article to help spread the word! This is awesome! 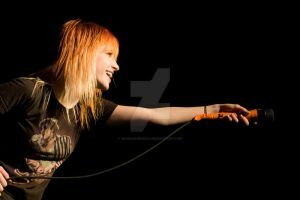 Go Hayley and Paramore! Brilliant photo, im amazed that you captured the colours of her hair so well in such dim lighting conditions, im finding i have to push ISO1600 just to get a shot off quickly. How did u do it? Flash gun? Or were you lucky that one of the lights bounced off at the right time and angle? her hair looks amazing in any color! This girl is s0 fantastic, and Param0re too ! where i can get this pic in hq? Great shot will great colour! Mind if i use it as an avatar? that concert was awesome I didn't like paramore that much though, but this shot is awesome ^^! Great music, great Havley, great colour, great bands they supported! this shot is amazing, and her hair is freaking awesome! I want hair like that! is it alright, if i used this for a wallpaper? she's a great singer and envied hair! can i download it? just to put it up on my wall. It's a beautiful picture.